Railpictures.ca - Jason Noe Photo: An eastbound Canadian Pacific train is viewed lifting loaded auto racks in Galt on the Waterloo Subdivision near Hespeler Road that were sitting on track WG–32 North. This area was drastically changed with the installation of the Hesepler Road overpass years later. The consist includes; SD40-2 5876, SD40-2 5788, SD40-2F 9012 and SD40-2’s 5990, 5867 and 5763. Once the lift is completed, the units and cars will return to their waiting train by the Galt station and continue the journey east to Toronto. October 10, 2009. | Railpictures.ca – Canadian Railway Photography – photographie ferroviaire Canadienne. 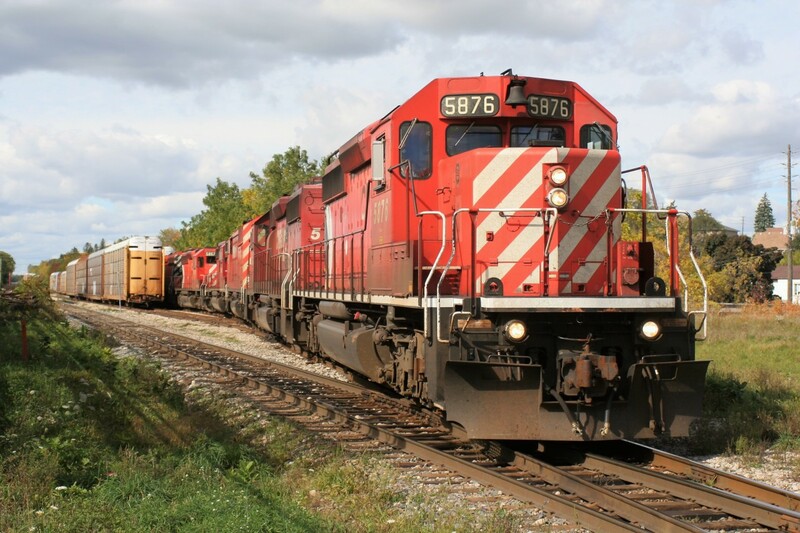 Caption: An eastbound Canadian Pacific train is viewed lifting loaded auto racks in Galt on the Waterloo Subdivision near Hespeler Road that were sitting on track WG–32 North. This area was drastically changed with the installation of the Hesepler Road overpass years later. The consist includes; SD40-2 5876, SD40-2 5788, SD40-2F 9012 and SD40-2’s 5990, 5867 and 5763. Once the lift is completed, the units and cars will return to their waiting train by the Galt station and continue the journey east to Toronto. October 10, 2009. Thanks Dave. Yes it might have been. I believe it ran later that day as I took the photograph in the early afternoon.